Due to a much bigger response than I expected, I am not currently accepting new contributions at this time. I hope to find a way to accommodate the large number of responses I received, so please stay tuned!! Last weekend I had the privilege of hearing from Beth Moore, while she poured into hundreds of women in their 20’s and 30’s who have a call to speaking and writing. The entire conference was amazing, but there was one moment I will never forget. At the end of the day, Beth told a story about attending her granddaughter’s dance recital. She noticed that every child on stage scanned the audience, searching for her mother’s eyes, and hoping for a look of pride. When Beth turned her gaze to the audience, there it was, every single mother, gazing at her child with a face full of love. And I thought I knew where Beth was going with this story. I thought Beth was setting up an analogy about faith. “God is looking at your service, and He is so proud of you!” That’s what I thought she would say. And it’s a great reminder. When she spoke those words, my entire row collectively choked back a sob. We weren’t expecting it, but we also didn’t realize how much we needed it. Yes, we are doing ministry for the approval of God alone, but encouragement is water for the soul, especially when it comes from some of the women who shaped you most. That’s why I will never forget that moment, and it got me to thinking. For so long, I have looked up to older women as role models, but somewhere between my twenties and thirties, women started looking up to me. This has taken me by surprise, because my influence is still modest, but as someone who bangs the drum for women’s gifts, I cannot ignore the weight of this responsibility. I know some of you look up to me and value my ministry, and I want you to know: I see you. I care about you and your gifts, and I am thrilled for God’s plans for you. I also want to serve Him, and you, in those plans. You must be open to editing. A writer’s best friend is a good editor, and while I make no claims to being a great editor, I want to expose you to the process, especially if you have never had an editor before. Write as an act of love for God, and your reader. If you are interested in writing for my blog, you can e-mail your ideas to me at sharon(at)sheworships.com with the subject line “Hear the Esther Generation”. And please don’t feel rushed. Since this is a monthly series, take all the time you need and the opportunity will still be here! Some of you may know that the term “Esther Generation” was coined by Ann Voskamp, and it captures my desire for this series, as well as my ministry as a whole. Esther was a woman of courage and self-sacrifice, who lived for a story much larger than her own. She leveraged her influence for those “outside the gate,” and she was ready to serve at “such a time as this.” She was prepared to lay down her life as an act of love for others, and we NEED women like that right now. We need women who are taking steps of faith and boldness in truth and love. We need women with deep, Christ-centered conviction and an unwavering commitment to God’s Word. Our world needs Esthers, and I want to be a part of raising these women up. That’s my heart, and my purpose. I hope this series encourages you to stand up and walk in your call. I hope it’s the kick in the pants you need to get writing. I hope it communicates that it’s not enough to have gifts if you don’t steward them for the glory of God. And I hope it reminds you that you have cheerleaders, and you have help. My younger sisters, I am not that much older than you, but I have been writing long enough to know that it’s hard, and the lies are loud, and the temptations to write for the wrong reasons are strong. We need each other to follow God well, so as much as I am able, I want to help you steward your calling for the Kingdom of God. Esther Generation, I love you. Let’s link arms, and run this race together. My name is Caitlin Taylor. I’m a nerd and can’t send an email to the one listed in the post for some reason, apologies! I came across your post from the (unofficial) LIT Facebook page – I attended the conference last Saturday and am still processing everything Jesus did that day. Something that I didn’t expect was that I would walk away from the conference with a community of women who would actually be interested in staying connected and continuing to support each other in our respective ministries. I’m a baby writer – I started my blog on February 1st and have so much to learn. The aim of my blog is to be a place of transparency and honesty for young women. So much of the internet is full of negativity and so many blogs rarely go beyond surface-level, so my only hope is that “She’s Taylored” will be different. I would absolutely love to contribute to your blog in the new series you’ve started – having my work edited would be such a great learning process. If I’m not a great fit, then this sponge of a writer would be grateful for any advice! Thank you for your ministry and for your willingness to mentor! Sharon, this was incredibly encouraging even to a “2 years past 20-something year old” :). I was contemplating weeks ago contacting you just to ask questions (regarding balancing the call to writing/motherhood/ministry/career) for insight and this further confirmed I should have listened to that nudge and not ignored it. It is hard to take steps and put yourself out there when you have a loving but truth-filled, bold message to share without any encouragement. The smallest bit goes the longest way. Even when we ignore our call to write, if we are still pursuing God I’ve realized he doesn’t let us forget about it. It is like a background alarm that never goes off. You can quiet it and hit snooze on it but it doesn’t stop. Your days are filled with wishes of having more time to write and after a while a strong sense of disobedience overtakes you. That’s when you quit making the excuses and do it. And the amount of joy and fulfillment in that – in pursuing God’s calling – is tremendous! Beth and the women with her were right, and I am so glad you took her words as a call to step up. We need more women like you! Encouragers, role models, and mentors who have walked the walk and care about raising up more women in this area of ministry. Thank you !!! This is beautiful! I also attended the conference and you captured the heart of it so well. Thank you for leading well. Wow I love this so much Thank you so much for sharing, for doing this, and for being so open to be a role model. Literally my first time ever reading any of your blogs and I love!!! Love this, Sharon! I’ve been considering the call into writing, and your post has interesting timing in my story right now. I’m not overlooking this as another possible nudge from the Lord, so thank you! Will you post from a newly-thirty-something? Literally got teary-eyed reading this… thank you for sharing your experience and I’m so glad God’s put this on your heart. Cheering you on as you cheer us on! Hi Sharon – It is so funny, I stumbled upon this page via She Reads Truth. This post jumped out at me as I’ve been struggling in my 20’s. As I continued to read and saw your call for 20 something’s to write , I was immediately excited! I’m going to take some time and pray about what I should write. I would love your editing and feedback! Thank you so much for pouring into our generation! I am neither a writer nor a 20-something. I’ll be 54 in a few weeks, but one of my top spiritual gifts is encouragement. 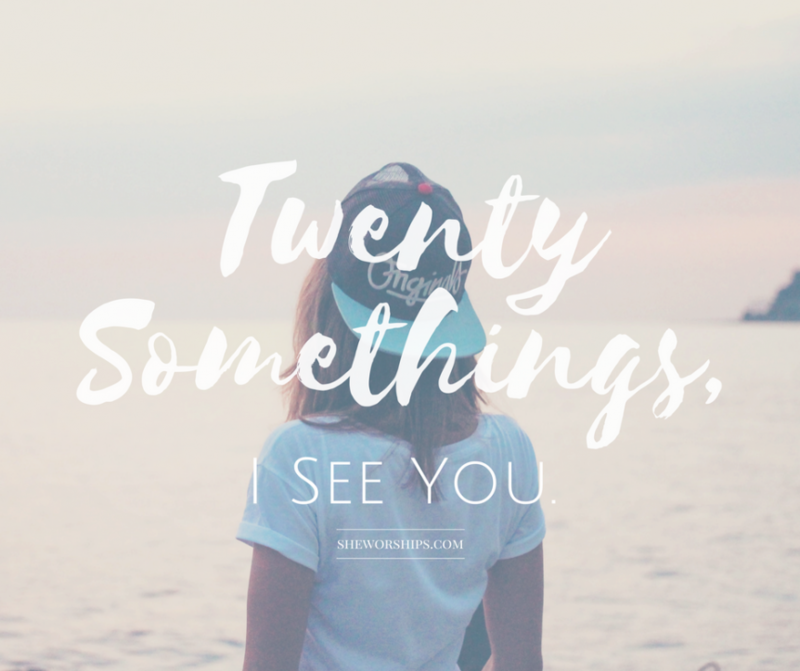 I’m in my second year as a MOPS mentor at our church, and I am humbled and thrilled at the spiritual maturity of younger women like you, the other ladies who have commented on this post, and the young women at our church. Thanks Sharon for writing this and for giving us the opportunity to write as well!